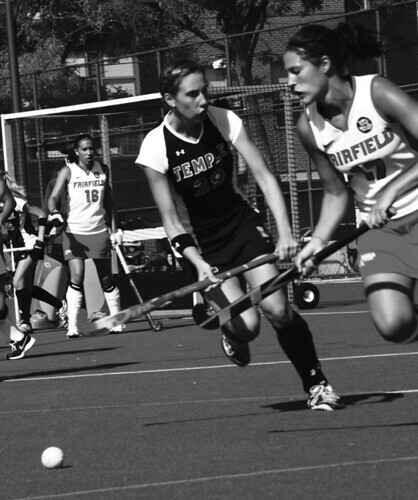 LESLIE FRAZER TTN Freshman forward Lauren Hunt challenges a Fairfield forward in Sunday’s match at Geasey Field. The team defeated the Stags, 1-0, to improve to 2-0 on the season. They play again Sept. 3. The Owls opened their 2010 season with a bit of unfinished business as they took the field this past weekend to host the Temple Invitational. The team was coming off their first Atlantic Ten Conference championship appearance in six years, but they fell short of the title when they lost in the game to Richmond, 3-0, a team that they defeated a week prior. The Owls are led by coach Amanda Janney, who has a winning record of 56-47 in her five-year tenure. Her task this year not only includes revamping a team that fell just shy of an A-10 title a season ago, but also trying to do so without the six seniors who graduated last year. The seniors from last season all played pivotal roles in the team’s success. Fullback Kate Stewart’s first career goal led to a 2-1 upset over 10th-ranked University of Massachusetts. Fullback Kristen Wanner notched two pivotal goals in a playoff-clinching win over Richmond (the Owls’ first defeat of Richmond ever), and midfielder Charise Young was honored by being named to the A-10 first team and the Division 1 Senior All Star Game. Although daunting, Janney has resources at her disposal to make up for the contributions from last year’s seniors. One of those resources will be Dalrymple. The Hanover native is coming off an impressive 2009 campaign – she started all 21 games in the net, recorded four shutouts, including a shutout of Saint Joseph’s in the A-10 semifinals, set a career high in saves in a game with 12 and posted a .699 save percentage for the year. Dalrymple’s steady play in net last season did not go unnoticed, as she had the opportunity to play for the USFHA New Jersey Senior High Performance Team over the summer – a summer which also included Dalrymple training with the USA National Team at the Olympic Training Center. Janney said she believes Dalrymple’s national team experience will only aid her this season. That new intensity has led to Dalrymple being named a team captain for this season, a role she’s embracing. Another weapon at Janney’s disposal will be junior forward Bridget Settles. Settles had a breakout sophomore season and quickly became one of the A-10’s most notorious scoring threats. Settles went from posting no goals in zero starts as a freshman to posting a team-best 12 goals in 20 starts as a sophomore. This positive trend is something Janney expects to continue. Settles was named to the A-10 Second Team All-Conference squad last season, and the Owls are banking on a big season from their top scoring threat. Janney, Settles and Dalrymple all seem to agree that it’s “A-10 title or bust” for the Owls this season. The Owls’ quest to accomplish their goal began this past weekend at Geasey Field, where the Owls faced Bucknell. Temple took the field in front of a crowd of 328 fans. It took a mere seven minutes for the scoring to begin, as Bucknell got things started with a goal by sophomore fullback Tayler Siegrist on a corner opportunity. The Owls were quick to strike back as the team had two close scoring opportunities within the next two minutes, but both were unsuccessful. With 21:33 remaining in the half, that all changed when sophomore midfielder Taylor Musser scored the first goal of the Owls’ season off an assist from Nichols. Janney’s squad did not wait long to take the lead, when less than a minute later, freshman fullback Molly Doyle scored on a corner opportunity. The Owls decided to pile on one more goal in the half as another freshman, midfielder Madi Blyler, got in on the scoring. The Temple offense was aggressive in the half, as evident by the outshooting of Bucknell, 11-6. The Owls went into the half with a 3-1 lead. Bucknell came out of the half fast, scoring within the first two minutes. However, the Cherry and White defense quickly snapped back into their rhythm and did not allow another goal the rest of the way. To seal the deal, Settles added the Owls’ fourth goal by dribbling past the Bucknell defense and putting a shot right past the goalie. “I felt really good and confident,” Settles said. The Owls walked away with a 4-2 victory to open up their A-10 title quest and Janney seemed pleased with their performance. Temple was not finished with the weekend as they went on to defeat Fairfield, 1-0, on Sunday. The game winner was scored a mere 6:46 into the game by sophomore forward Katie Briglia on a rebound opportunity. The Owls continue their A-10 title quest and look to extend their winning streak Sept. 3 against St. Francis in Loretto, Pa.